Minato Ku (or Ward) is one of 23 Special Wards in central Tokyo. The name means “port”, referring to its seaside location, although due to the land reclamation, most areas in the district are quite far for the sea these days. 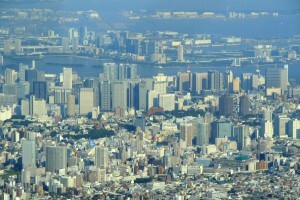 Nevertheless much of the Tokyo Bay area is under the jurisdiction of Minato Ward. For English speakers, this ward would be the most comfortable to be based. It is a sought-after ward by both foreign residents and Japanese residents alike; and this means that land prices are one of the highest for metropolitan Tokyo. Many of the residential areas are prestigious and upmarket. In addition numerous embassies are based here, and in line with worldwide standards, areas with high concentrations of consulates are normally exclusive, high-end and expensive locales. Japan is no exception to this rule. The high concentration of expatriate and high-income earners in turn bring foreign-friendly, international services and businesses to the area — such as international schools, international supermarkets, multilingual medical and dental clinics. There are neighborhoods that feel as if one is not in Tokyo but abroad. Generally speaking, rents are high in the area, especially in the international hubs of Roppongi, Azabu, Akasaka, Hiroo and Aoyama districts. The Ward office is also one of the most English and foreigner-friendly residents can expect to encounter. It is also more open to integrating foreign residents into the Ward and can assist with helping foreigner to use its public services and facilities much better than most other wards. Click here for the Minato Ward Office website. Public services; such as public playgrounds, parks, gardens, children centers, libraries and sports centers, tend to be better than other wards, given the high tax income Minato Ward is able to collect. 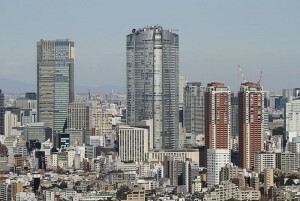 The largest commercial developments within the Akasaka address are Ark Hills, Tokyo Midtown and Akasaka Sacas. ?Akasaka is basically a commercial area featuring commercial buildings, bars, restaurants and hotels. Since it?? ?s a major business district, the surroundings are urban and surrounded by high rise buildings. On the upper side lies Nagatacho, the center of Japan?? ?s politics where the National Diet (Japan?? ?s Parliament) is based. On the lower side is Roppongi. 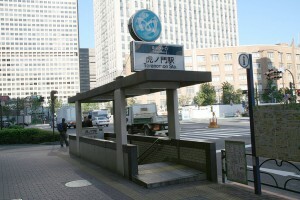 There are several train stations that serve the Akasaka area and these are: Roppongi, Roppongi-Itchome, Nogizaka, Tameike-Sanno, Akasaka and Akasaka-Mitsuke. This locale is famous for its restaurant and bar scene that dot around the Akasaka-Mitsuke train station on Misuji Road and Hitotsuji Road. The Arks Hill Complex is home to a wide variety of restaurants and cafes and offers upscale residences and service apartments, as well as Suntory Hall and the ANA Intercontinental Hotel. 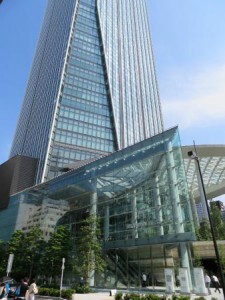 The TBS broadcasting center created the Akasaka Sacas property development and it includes a 39-story office building called Biz Tower and an upscale residence called Akasaka The Residence. A number of embassies are also based in Akasaka, including the US embassy. The German cultural center, Goethe Institute, is also located in the vicinity. Refinement is the ultimate word to describe Aoyama. One of Tokyo’s wealthiest areas, Aoyama is a center of haute-couture and elegant cafes and restaurants to match the fashion. Although Aoyama’s atmosphere centers on refined and modern style, with many eclectic buildings housing major design labels, (for instance the Prada Building), the neighborhood also has a spiritual side. There are shrines, temples, and an historic cemetery located within in the locale. 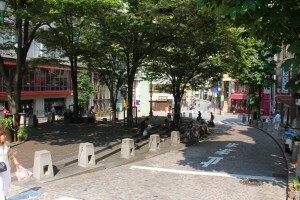 Aoyama Avenue (Route 246) runs between Kita Aoyama and Minami Aoyama and houses a variety of retail choices in small, modern shopping centers, restaurants, salons and spas. 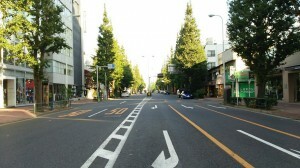 Eventually this same avenue leads to Shibuya, which is walking distance away from the heart of Aoyama?? ?s center. The area’s next best known street, Omotesando Avenue (running off Aoyama-dori), has some of Tokyo’s best shopping, bookshops, boutiques doting along the beautiful tree-lined street. 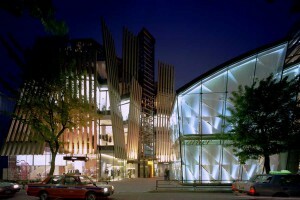 Omotesando Hills is a major property development that encompasses fashionable shops, restaurants and residences. A stone?? ?s throw away from Omotesando are the areas of Harajuku and Jingumae. Harajuku is the center of young fashion. While Aoyama and Omotesando boast refined elegance, Harajuku is the younger rebel with its youthful and unique shops and crowds of high-school age girls running about, munching on a variety of street food and ice-cream crepes. Minami Aoyama is a sought-after address for both well-heeled Japanese and foreign residents alike. 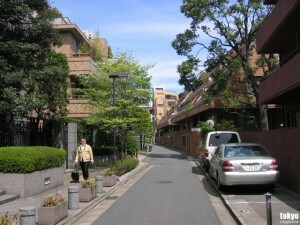 Many of Tokyo’s oldest and wealthiest families live in Aoyama-Itchome. The land value here is one of the most expensive in the country. Also in the area are the United Nations University and the Aoyama Gakuin University. The United Nations University has permanent UN staff and hosts international conferences. 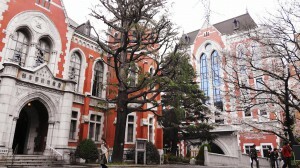 Founded in 1949, Aoyama Gakuin University is a well-known academic institution. The following two blogs provide many interesting photos highlighting the locale: Highsnobiety and Airbnb. The Azabu area includes Azabu-Juban, Azabudai, Nishi-Azabu, Higashi-Azabu, Minami-Azabu and Moto-Azabu. The area is served by the Hiroo, Azabu Juban, Roppongi, Akanebashi and Kamiyacho train stations. Generally speaking, the Azabu locale is one of Tokyo?? 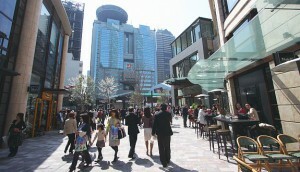 ?s most prestigious and expensive address and attracts both high-income earning foreigners and local people. It is also Tokyo?? ?s most international area, especially for English-speaking expats and Europeans. Home to a large number of embassies and multinationals, there are a wide range of amenities and services that cater to foreigners. Comfort also extends beyond just stores and restaurants, to include a wide number of churches, a Jewish synagogue, and private clubs set up for expats. Family-friendly locations include Minami, Nishi and Moto Azabu. These areas offer a variety of supermarkets that stock products from abroad, international schools and preschools and residences that cater to expats. The delights of Azabu Juban and Roppongi are in close proximity and offer residents in the area a good range of entertainment, shopping and dining options. Other than Roppongi and the immediate radius surrounding the train stations, the neighbourhoods offer much greenery and tranquility. There are also a good selection of public parks and playgrounds in the vicinity. Part of Minato Ward?? ?s charm is the area surrounding the Tokyo Bay area. Residences in this part of the city tend to be super high-rise establishments that maximise the enjoyment of the Bay views. While Kounan faces the East exit of Shinagawa train station, it is under the jurisdiction of Minato Ward. Kounan?? ?s origins were industrial in the past but the redevelopment of the area has seen the building of many new tower-style residential apartments along the waterfront. There are also commercial establishments in the vicinity; such as a hotel (Strings Intercontinental Hotel) and large business development complex called Intercity, which houses restaurants, conference facilities and offices. Mita is a quiet residential neighborhood in Minato Ward that has a long established history in Tokyo. Old affluent families have long made this area their home. Quite convenient and central, the neighborhood is served by the Shirokane Takanawa, Akanebashi or Azabu Juban train stations. 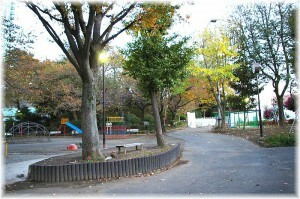 There are various playgrounds and small parks in the area. For example, Mita?? ?s Kamezuka Park, is open and spacious, offering an assortment of children play equipment and a large open space well used by the numerous families who reside in the area. Both Keio University and Meiji Gakuin University are located in Mita along with numerous consulates, including the embassies of Australia, Italy and Hungary. A short distance from the northern part of Mita is Shiba Park is also in close proximity. The park also provides sports facilities such as a baseball field, tennis courts and a swimming pool amongst the greenery. 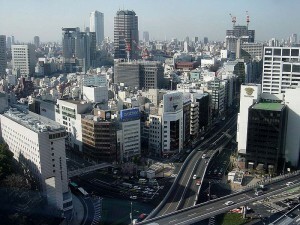 Roppongi is a major commercial area in Minato Ward that houses many multinationals and embassies. The most international area in Tokyo, the district also has prestigious property developments of Roppongi Hills and Tokyo Midtown, which encompasses luxury residences with top-grade hotels and a wide variety of upscale shops and restaurants. With a vibrant night scene offering a vast array of restaurants and bars, there are also no shortage of top-grade hotels and luxury label retailers in the area. 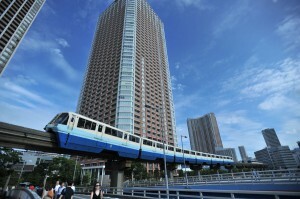 With ample transportation options, other parts of downtown Tokyo is easily accessible. Supermarkets in the area carry a wide variety of international products and there are many medical and dental clinics that offer assistance in English, as well as other services for daily life, such as hair salons. 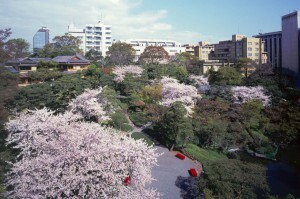 Roppongi also has museums and parks in the vicinity. There are also a number of international schools and preschools in the area, and school buses for major international schools also run through Roppongi. North of Kounan is Shibaura, another district within Minato Ward. Shibaura is a sought-after location for residents who favor modern, high-rise living in towers that provide a hotel-like environment. Many of them are high-end and prestigious, offering full concierge services and world-class amenities. The bay views are gorgeous, particularly at night with views of Rainbow Bridge, the colorful Palette Town Ferris Wheel and Odaiba District. The Shirokane area is an upmarket residential area that is popular with foreign families. Train stations such as Shirokanedai and Shirokane-Takanawa serve the Shirokane area. The name literally means platinum in Japanese, associating the area with something valuable and expensive. Shirokane has good access to foreign-friendly amenities and the international preschools located in this vicinity offer a wide range of tuition costs. One of the highlights is the well-known Platinum Street, which showcases upscale restaurants, cafes, fancy cake shops and high-end fashion boutiques nestled in the Gingko tree-lined street. Also, in close proximity is the Institute of Nature Study, a large nature park as well as the Tokyo Metropolitan Teien Art Museum. Shirokane 6-chome and 2-chome are particularly nice pockets, and there are charming houses and low-rise apartment buildings in this area. At the southern end of Mita, lies Takanawa, another tranquil and family-oriented residential neighborhood in Minato Ward. ?There are a large number of embassies, posh residences and shrines in the area. Depending on location, Takanawa is served by Shirokane-Takanawa, Shinagawa and Sengakuji train stations. The South end of Takanawa is close to one of Tokyo?? ?s major transport hubs, Shinagawa. Here, there are also shopping centers and hotels, as well as international restaurant chains like Outback Steakhouse and TGI Fridays. A rather commercial location, Toranomon in Minato Ward is one of the Tokyo?? ?s most recent grand-scale redevelopments. With the introduction of Mori Building Co., Ltd?? ?s Toranomon Hills, more developments are slated to come. 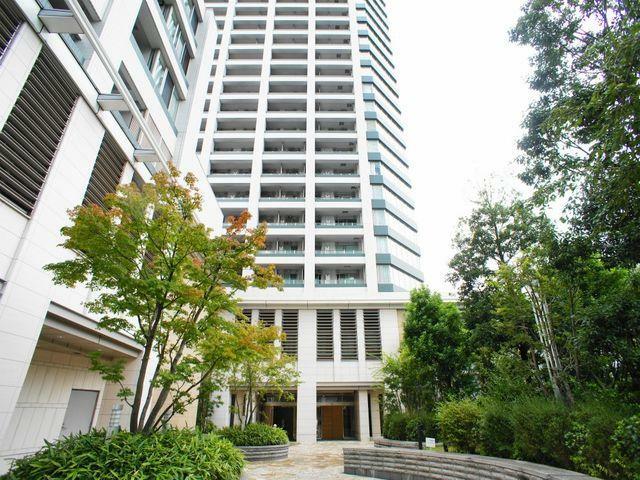 Residing in Toranomon will provide easy access to the surrounding business hub. However, note that massive changes and construction work is due to take place. Like all of Mori?? ?s major developments, Toranomon Hills encompasses a grade A office building with conference space, private residences, a high-end hotel (this time, a boutique hotel, the Andaz, belonging to the Hyatt Group), a selection of trendy restaurants within well-designed public grounds. As part of the Tokyo Metropolitan government?? ?s redevelopment efforts to renew this area and revitalise the economy, a new subway station along the Hibiya train line is in the works. The addition is slated to be in between the Kasumigaseki and Kamiyacho train stations, where a bus terminal will also be added. 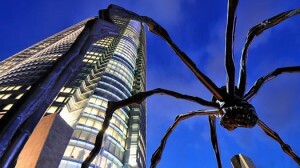 ?At the moment, the area is served by the Toranomon, Kamiyacho and Kasumigaseki train stations. Kasumigaseki, which neighbors Toranomon, is Tokyo?? ?s bureaucratic center with the government ministries based there.